Datalogic Gryphon I 4400: GD4430 - SCANNER ONLY. 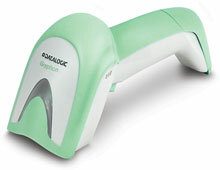 2D Imager, Health Care Disinfectant-ready housing, USB/RS-232/Keyboard wedge/WE interfaces. Does not include necessary cables or accessories. For the full kit see (Part# GD4430-HCK1). The Datalogic GD4430-HC is also known as Data Logic	DTL-GD4430-HC	or GD4430HC	.